The very first banh mi I had was in the summer of 2012 when I was visiting home at Smorgasburg -- the open air food market in Williamsburg, Brooklyn. Rachel, Julie and I were very hungry and Rachel, pretty much a native Williamsburger, assured me that this banh mi would satisfy. I was open, so I ordered a "traditional" banh mi with vegan sausage, pickled carrots, cucumber, fresh jalapeños and coriander in a mayonnaised white hot dog bun. The stall offered Sriracha on the side and I'm not one to turn down a delicious hot sauce so I poured it on. And then, standing up in a corner, my first bite led to a burst of explosion in my mouth -- FIRE! from the Sriracha sauce and fresh jalapeños. Then, I noticed that it had pretty much all kinds of delightful textures -- crunchy cucumber, umami vegan sausage, spicy sauce, sour pickle, sweet from the bun and fresh and palate-cleansing from the coriander. I was in love! I vowed to bring back everyone I knew to try this. And I did -- I took my mom and sister in the summer of 2013, but perhaps because it was during a serious heatwave that I wasn't able to find that stall again? Perhaps I'll find it again this summer. In any case, after my first banh mi, I have been making them at home ever since. My husband agreed that it was a most delicious sandwich and people at his work were envious when he took them for his breakfast. I even made it for my brother who was so delighted that he simply had to eat another one even though they are rather large. 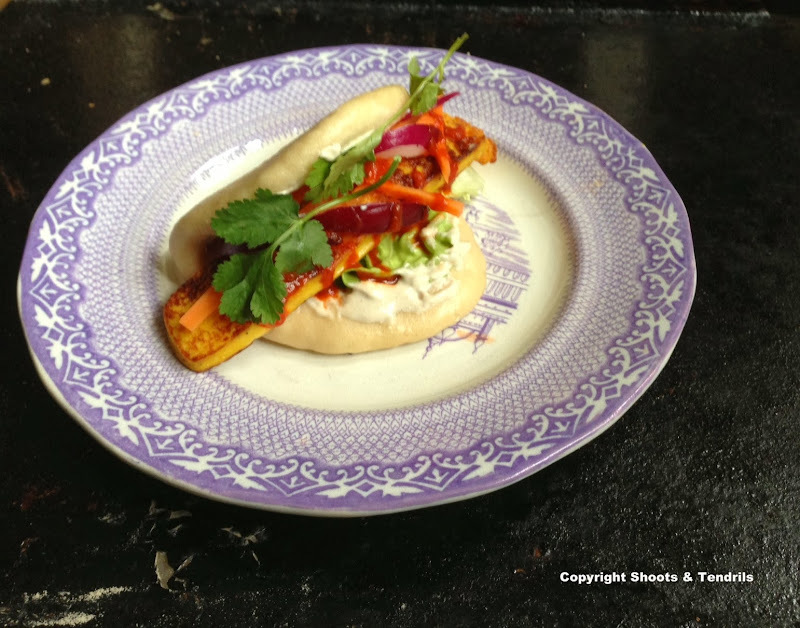 While this is a story about banh mi, I can't not tell you a little about the bao bun. I had read about this sweet savory Chinese appetizer on the LA Times many years ago and have been making it on and off. But then my sister took me to Off The Grid last summer in San Francisco and there I had my first bao bun from The Chairman Bao Truck. This wasn't the dumpling baos that I had made -- this looked more like a thick taco made from very tender white bread. Inside, they placed mayonnaise, hoisin sauce and miso-lemongrass marinated tofu and Sriracha sauce. I wasn't expecting much but that too was just an explosion of flavors and I felt very lucky to have experienced that, thanks to my sister. So the Chairman bao has been on my to-do list for a while and I finally made them, using the same LA Times dough recipe with success. While I initially made these bao buns with hoisin sauce and tofu, I was craving bahn mi and happened to have extra bao buns in the freezer. I simply defrosted them and made banh mis with my soy-free tofu. You could of course use a soft whole grain baguette if you don't have bao buns but I do love them with bao buns because you eat more of the filling rather than the bread. I admit I have fused two different cultures (or rather, three cultures: Vietnamese, French, Chinese) into this sandwich but it works really well, in my eyes, but will you also agree? You simply have to make this if you're looking for an exciting, new kind of sandwich! It would be great to take to a picnic and it's even good for brunch. 2. In a bowl, mix the carrots, cabbage, mayonnaise, Worcestershire sauce, soy sauce and coriander. 3. Assembly: Add the vegetable mixture on the bottom of the bread, then tofu and sliced jalapeños, fresh coriander sprigs and Sriracha sauce. Enjoy! These look exactly like the ones we had from the Smorgasburg Market! I can't wait to eat more with you this summer! Papri Chaat or Indian nachos! Hello and welcome to Shoots & Tendrils! I'm a Dietitian with a background in food science & nutrition, Recipe Developer, and Chairwoman of the Swedish legume society. Having lived on three very different continents, I'm truly inspired by the different nooks of the world and that's also reflected in my recipes. © Copyright 2009-2019. All Right Reserved © Copyright Shoots & Tendrils 2009-2019. Simple theme. Powered by Blogger.